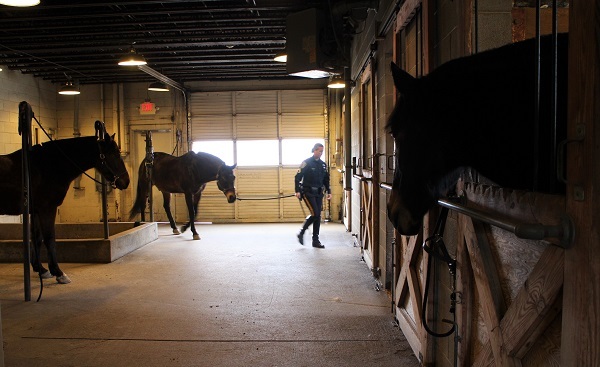 Efforts to provide a new home for the Richmond Police Mounted Unit have hit a hurdle, as preliminary bids for a planned equestrian center to replace the unit’s stables on Brook Road all came in at more than $1 million over budget. The city’s procurement services department on Jan. 3 issued a notice of cancellation for bids on the proposed project to build a 10,600-square-foot facility on 3.5 acres of city-owned property at 3900 Crestview Road between Chimborazo and Gillies Creek. The lowest bid came in at $2.5 million – significantly higher than the projected cost of about $1.4 million, which the city planned to cover through general obligation bonds. The cancellation notice, first reported by the Richmond Free Press, applies to that specific round of bids for the project. 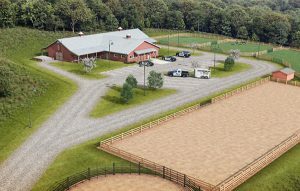 But its wording – “Police Equestrian Center Project is cancelled in its entirety” – prompted concerns from supporters that the project itself was being scrapped. Leslie Buck, president of the Friends of the Richmond Mounted Squad, said she’s received assurances from the police department’s top brass that plans for a new equestrian center are still a go, but that they may need to be changed due to the bids coming in higher than expected. The unit’s Brook Road stables under the Chamberlayne Avenue overpass. 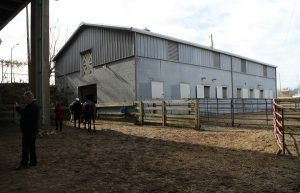 The facility would replace the unit’s stables at 801 Brook Road, below the Chamberlayne Avenue overpass near the Interstate 64/95 interchange. Buck said she was told that challenges with the Crestview Road site to make it suitable for the facility are what drove up the bids. “What I was told is the problem is not the building itself; it is the land renovation that has to be done,” Buck said. “Everywhere we find within the city limits has got to have an exuberant amount of land reconstruction done to it to support what we want to do to it: building, pastures, fields, etc. We certainly don’t want the horses to be unsafe. Gene Lepley, public affairs director for Richmond Police, said the department is weighing next steps for the project and how to move forward in light of the higher bids. “We’re looking at other options as we move forward to find the horses a new facility,” Lepley said. A replacement facility has been sought for years, as the city has deemed the Brook Road stables operationally deficient. Located there since 1972, the stables are prone to flooding from storms and have had maintenance problems that have prompted the search for a replacement. The city approved plans for the Crestview Road site last year. Designs by Moseley Architects showed a barn-style structure with stables for the unit’s horses and offices for the unit’s 10 or so mounted officers. Plans also called for pastures for the horses, an outdoor training ring and pen, and a gravel parking area. The plans were based on a site assessment from engineering firm Timmons Group. Buck said she was told the department is considering alternate sites by widening its search area. She said the department asked the bidders to reassess the Crestview Road site, but that each said the project as proposed could not be done there within its proposed budget. Bidding opened Nov. 9, with bids received from four firms: Hanover-based A.D. Whittaker Construction, which bid $2.52 million overall; Virginia Beach-based Noah Enterprises: $2.61 million; Bon Air-based RMT Construction & Development Group: $2.56 million; and Ashland-based Southwood Building Systems: $2.72 million. The nonprofit Friends group has raised more than $80,000 to support the new facility – not enough to cover the difference of the bids, Buck said. The unit held a badging ceremony Friday for its newest member, Aslan. 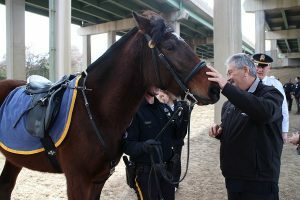 Richmond’s mounted unit dates to 1894, making it one of the oldest continuously operating units in the country, according to the police department’s website. On Friday, the unit welcomed its newest member, Aslan, a 3½-year-old horse from Asbury University in Lexington, Kentucky. The unit held a badging ceremony for Aslan at the Brook Road stables, bringing the number of horses in the unit back to three. Aslan replaces Rio, the unit’s former lead horse that retired in December. The unit plans to add a fourth horse in coming weeks. The Friends group continues to hold fundraisers to support the new facility. The next fundraiser is scheduled from 3 to 8 p.m. Feb. 21 at Fine Creek Brewing Co. in Powhatan. 5 Comments on "Police equestrian center bids come in $1M over budget"
How much of it is the site work extra work and how much is poor planning/design??? This is one of several City capital projects that have come in 40-60% over their costs estimates that were provided. Looks like my neighborhood will be battling the police for capital funds (I hope Council can find funds for both) as the cleaning/dredging of the lakes in Byrd Park were bid out and came in 60% over budget. In that case the estimates did take into account the cost of disposing of the contaminated sludge. Hard to imagine a 4 horse barn and some infrastructure costs $2.5 million. Might be a good idea to look around and find something they can buy or lease. This seems like an awful lot for the current team of 3 to 4 horses. For example, don’t build build the big pen AND the ring in the beginning. I would think some of these improvements could be delayed or phased-in down the road as funds become available. Not sure but I think it is that they can’t meet the requirements for the animals to use/live on the site if extensive soil remediation isn’t done first. However, as you and Bruce said maybe the soil first and a temp/small barn and a trailer office until more funds can be raised to complete the entire project? Back the truck up on this whole thing….Projected cost of $1.4 million? Someone said you could get this facility for that? With site work?? Fire them.